Get answers to Heyday’s most common questions. 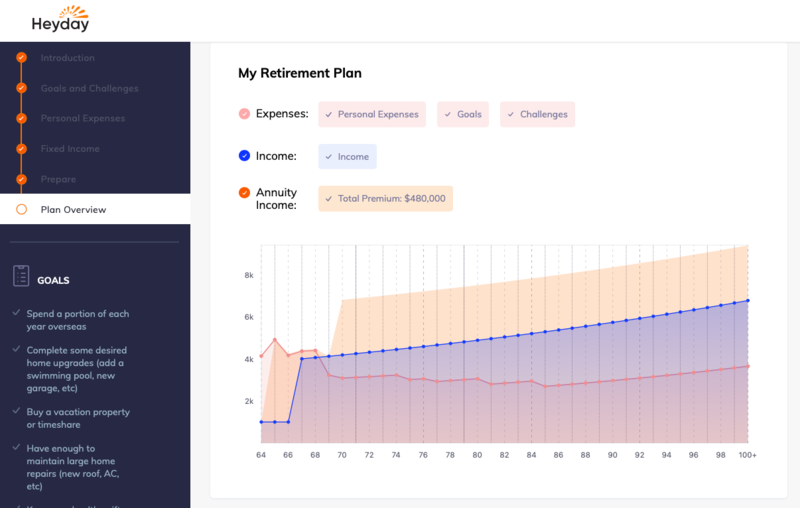 How much does it cost to use the Heyday retirement income planner app? Using the Heyday app to create a retirement income plan is completely free, and doing so does not obligate you to secure your custom income plan. Because your plan is customized to your goals, expenses and fixed income sources, no two plans are alike. The easiest way to determine how much your plan would cost is to use the Heyday app and create a free retirement income plan. At the end of the process, your retirement income plan will show your expenses, income and how much additional income you’ll need to secure your plan. If you choose to pursue the income plan provided, all fees are included in the overall price of the plan. This way, you don’t pay Heyday any surprise fees — not then, not annually, not ever. Your Heyday retirement income plan will use as little of your savings and retirement assets as possible to help secure the guaranteed income you’ll need each month to cover your goals and expenses. How can I be sure my financial information will be kept secure and private? ● SSL Certificate - Our website and the Heyday app have obtained SSL web certificates which establish a secure connection by encrypting your information as its being transmitted. ● Secure Microsoft Cloud Platform - Heyday doesn’t store your personal information on our own servers. Instead, we use the Microsoft Azure cloud platform that utilizes industry best practices and multi-layered security across several data centers around the globe. Am I eligible to create a retirement income plan with the Heyday app? Additional restrictions may apply based on available assets and financial product requirements. If you’re a U.S. citizen who lives outside of Florida, we may be able to assist you through one of our partners. Please contact Heyday Retirement for additional information. Visit the Heyday app to get started and create a free profile. Videos and interactive components will guide you step-by-step through the process to help identify your retirement goals, challenges, recurring expenses and even the income you’ll have from Social Security, pensions and other sources. All of this information is used to design an actionable retirement income plan tailored to your unique wants, needs and financial situation. ● Schedule a meeting - book a complimentary meeting with a Heyday Assistant here. ● Call - dial 1(844) 4-HEYDAY (1-844-443-9329), Monday through Friday during regular office hours of 9:00 - 5:00 EDT. What info do I need to use the Heyday app? You can complete the Heyday app over the course of days or weeks, or build your plan in one sitting — it’s totally up to you. The app will also walk you through your goals, plus any challenges you’d like to plan for in retirement. Why do I need to provide such detailed financial information? Since Heyday’s retirement income plans are tailored to your specific goals and finances, it’s important to be as accurate as possible. This custom plan is meant to be an actionable roadmap to helping you attain your unique retirement goals and includes “buckets” of funds designated for the activities you’d like to prepare for. How much experience does Heyday have? The Heyday team has been helping retirees and pre-retirees secure their retirement financial strategies since 2001. The lessons learned over the past 17 years are the guiding principles used in the Heyday approach and algorithm we use to create custom retirement income plans. Learn more about Heyday here. Take Heyday's free online retirement income planner for a spin to help secure the funds you need for the next chapter you really want!